THE NAKED LUNCH BY WILLIAM BURROUGHS 1ST EDITION PAPERBACK ORIGINAL. Paperback Original issued in pictorial dust jacket designed by Burroughs. 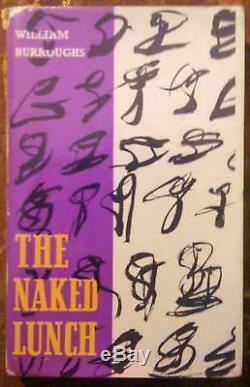 First edition, FIRST ISSUE with the price of 1500f. A near fine first in very good plus dj. Tipped in signature PUBLISHER: OLYMPIA 1959. 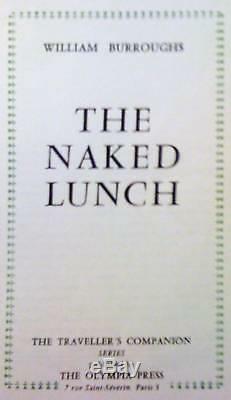 The item "THE NAKED LUNCH WILLIAM BURROUGHS 1ST 1959 Paris edition" is in sale since Tuesday, October 19, 2010. This item is in the category "Books\Antiquarian & Collectible". The seller is "vagbk" and is located in LOS ANGELES, CA. This item can be shipped worldwide.